Let's face it, I'm no stranger to a make up splurge in Boots now and then, but these guys are the ones that keep coming back and ask to be swatched every time I pass them! 1. Real Techniques and I have a great relationship, as their brushes have literally changed the way I apply my make-up to the final look. I adore big fluffy brushes, and as these are so versatile, they'd be great for taking away on holiday and not taking up much room. 2. It's official, Smashbox do the best primers. I've used their original Photo Finish Primer for a while now and love the finished look it gives to my foundation. It would be interesting to see how the 'blemish control' element works, because I've found that most primers tend to clog up pores quite easily. 3. If you haven't heard about the Bobbi Brown Shimmer Blocks, then where have you been?! They've been circulating the beauty bloggers for a while now, but they're so pretty in reality that they're too hard to resist. Their Pink Quartz Shimmer Brick is also gorgeous and would be great for a nice healthy flush in winter. 4. Again, another cult product that I've seen a few blog posts on. Charlotte Tilbury doesn't seem to be putting a foot wrong at the moment! Her eyeshadow quads are beautiful, and I can totally see myself using the top two shades for the day time and adding more definition with the bottom two for the evenings. 6. Whenever I go into SpaceNK I'm forever swatching the NARS Multiples and cooing over their creamy and soft texture. I've tried to narrow it down, and Maldives stands on top, but I would be lying if I didn't want the whole range! 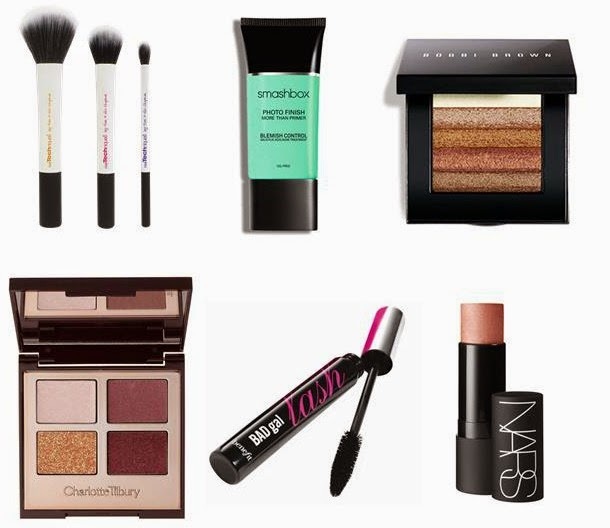 So there's my dream high-end make up wishlist, in all their glory. What's your favourite high-end make up product?